The B. 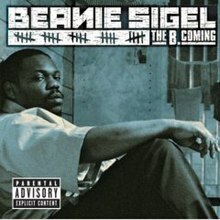 Coming is the third studio album by rapper Beanie Sigel, released by Dame Dash Music Group on March 29, 2005. The album contains 15 songs. Special guests include Freeway, Redman, Snoop Dogg, Bun B, Jay-Z, Cam'ron, and others. The album was completed before Beanie had to serve jail time in 2004. Pitchfork (8.5 out of 10) - "Only two things matter here: the production, which is masterful, and Beanie himself, a virtuoso of lonely, bitter desperation. " Entertainment Weekly [15 Apr 2005, p. 78] (83% out of 100%)-Finds him at his most vulnerable—and his best. Stylus Magazine (B+) - "One of the strongest albums of 2005, Beanie Sigel stands among the greatest of the Roc-A-Fella catalogue with technical ability and an emotional severity worth experiencing." New Musical Express [23 Apr 2005, p. 51](NME) - "As defiant as ever." All Music Guide - "Those looking for a direct story of how Beanie earned three years in the clink will be somewhat disappointed, but these chunks of insight into the man's turmoil -- and the couple party tunes that go with them - add up to one hell of an album." Top 50 albums of 2005 by pitchfork media: number 32. The song "Feel it in the Air" was listed as the 349th best song of the 2000s by Pitchfork Media. Overall Metacritic gave "The B. Coming" a total critic score of 73 out of 100 based on 14 reviews. ^ a b David Jeffries. "The B. Coming". Allmusic. Retrieved 2012-01-15. ^ Breihan, Tom (2005-04-12). "Beanie Sigel: The B.Coming | Album Reviews". Pitchfork. Retrieved 2012-01-15. ^ "Beanie Sigel - The B-Coming - Review". Stylus Magazine. Retrieved 2012-01-15. ^ Staff, Pitchfork (2005-12-31). "Staff Lists: Top 50 Albums of 2005 | Features". Pitchfork. Retrieved 2012-01-15. This page was last edited on 24 January 2019, at 21:21 (UTC).